I am leaving my meaningful, well-paying, fun, job at Ryerson University to go to my business, SkillsCamp, full-time. For some of you, this is old news. For some, it’s unsurprising news. And well, some of you probably didn’t even know that I worked at Ryerson because you’ve ONLY ever interfaced with me through SkillsCamp. But, it’s true — I’m making the leap. My last official day at Ryerson is July 12th (the night I leave for a vacation to Amsterdam!) This is a huge moment for me. Often when people leave a job, it’s because they’re moving AWAY from something (people, location, culture, title, etc. ), but I can tell you that’s not the case here. I grew up at Ryerson (well, since I was 17). My particular role in Ryerson Student Affairs at the intersection of creative storytelling and student development/education is a role I quite literally helped develop. It’s perfect for me. The culture in RyersonSA is supportive, inclusive, and creative. My students give me life and energy. The pay and benefits are great too! I’m not moving AWAY from something, but rather TOWARDS an even greater love: SkillsCamp. I’m moving towards my own business, a soft skills training company. It’s a move that lets me narrow in on the stuff I loved most in these past few years. It enables me to bring that life-changing work happening in Student Affairs offices around the continent to a broader corporate audience and other educational institutions. I have a lot of incredibly talented marketing and communications professionals in my network. If you, or someone you know, are interested in a role like the one I’m transitioning out of here at RyersonSA, please APPLY NOW. You have until Monday, June 11th. I want someone 1000x better than me to uphold and build on the legacy! The entrepreneurial journey looks different for everyone. Right now, entrepreneurship is having its moment in the sun. The media depicts it as shiny tech startups, massive angel investments, and billion-dollar valuations. But small business is the oldest profession, and many, many, MANY people have found many, many, MANY different routes to getting there. This whole “fail fast, fail early!” / “invest everything you’ve got!” culture is privileged, in my opinion. It’s easier to risk everything you have when you know you have a family or trust fund ready to catch you when you fail. Not so easy when failing might mean you can’t pay rent or buy groceries. So, I’m leaping when it’s best for me — personally and financially. There are a lot of emotions in a transition like this. At times, I’m sad to leave my team and students at Ryerson, but I know it feels like the right time. Sometimes I’m nervous because of course, I don’t want to fail. But mostly, I’m excited for what the next year will bring, and I hope you’ll be right there with me. The truth is, the world needs more soft skills. In fact, I wrote a whole other blog about why I started SkillsCamp if you’re interested in learning more. Skills like teamwork, communication, productivity, or intergenerational understanding are the most important to employers when hiring, engaging, and retaining good people. Skills like empathy, stress management, and resilience are critical for how you manage yourself and understand the world around you. Yet, development in these areas takes a back seat. We want to help fix that. 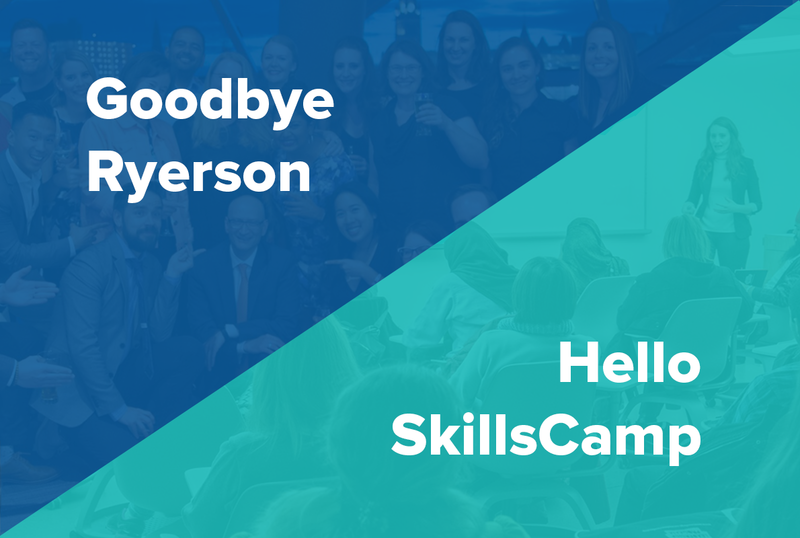 I believe in the mission of SkillsCamp, and I have faith that we’re going to help a lot of people develop the skills necessary to succeed in their personal, professional, and academic lives. We work with other businesses and educational institutions to do this. If you’re interested in working with us or just wish to follow along, we hope you’ll reach out. If you want to learn more about SkillsCamp, you can watch our intro video below or check out the website at: https://skillscamp.co.